Join us in chapel for a Maundy Thursday service of poetry and readings. University Pastor Sonja Hagander is preaching. String Studio recital. FREE and open to the public. Editor's Note: Andrew and Sarah Wilson will be presenting about their pilgramage at Augsburg's Founders' Day celebrations, Nov. 10-11. On the morning of August 22, 2010, Andrew and Sarah Wilson will depart from the Augustinian priory in Erfurt, Germany, taking the first steps of their thousand-mile pilgrimage to Rome. The Wilsons will follow roughly the same path Augustinian friar Martin Luther trod 500 years ago in 1510. Augsburg religion professor, Hans Wiersma, will be among those sending the Wilsons off from Erfurt. Wiersma will walk with the couple as far as Coburg, Germany. After the close of their journey on October 31, the Wilsons will travel to Augsburg College to speak at the school's annual Founders Day celebration in November. The hike will take 70 days and will pass through southern Germany, Austria, Liechtenstein, Switzerland, and Italy, before arriving in Rome in the last days of October. Luther came to Rome with high expectations but was ultimately disappointed. Only seven years after his trip to Rome, he posted the Ninety-Five Theses, commonly regarded as the beginning of the Protestant Reformation. Only three years after that, in 1520, he was excommunicated by Pope Leo X. But reliving old quarrels is not the Wilsons' intent. "We noticed this significant anniversary coming up," said Andrew Wilson, who holds a doctorate in Church History from Princeton Theological Seminary and is a Fellow at the Foundation for Interreligious and Intercultural Research and Dialogue, "and thought it would be great to commemorate it by retracing Luther's own steps. But what's the right way to do that in an ecumenical age?" The answer came to Sarah Wilson, who holds a doctorate from Princeton Seminary in Systematic Theology and is an ordained Lutheran pastor, after she joined the staff of the Institute for Ecumenical Research in Strasbourg, France. Dedicated to understanding the issues that divide Lutherans from other churches around the globe, the Institute for Ecumenical Research also seeks to work through such divisions and create broader cooperation in global Christianity. "Incredible progress has been made on the scholarly level between divided churches," she explained. "But this progress has hardly made its way to the people in the pews at all. It's as if fifty years of dialogue never happened. How could we let people know about these amazing developments? How could we get them even to care?" It was Andrew Wilson who realized the possibility of leveraging social media to spread the word on a grassroots level. "People are busy and won't take time to read stiff academic studies or listen to impenetrable church statements. But they'll read a hiking blog. They'll 'like' things on Facebook. They'll follow Tweets. So we're using these media to share the news about our trip, educate about the Reformation, and highlight the amazing rapprochement that has already occurred between two churches that fought physical as well as theological wars for centuries." "The Reformation was a communication revolution where mass-produced polemical pamphlets spread fresh insights into Christianity across Europe," he mused, "but also hardened a divided and dividing church. Perhaps our current communication revolution will reunite it in unforeseen ways." The Wilsons' blog is called www.hereiwalk.org, a pun on the famous words "Here I stand" that Luther uttered during his trial in Worms, Germany. Interest in pilgrimages has exploded among Protestants in recent years. Many European churches are setting up offices for pilgrimage and establishing routes for pilgrims to follow. "Even non-believers can get into 'pilgrimages,'" added Andrew Wilson, an experienced hiker and mountaineer. "It's like hiking, but with the added layer of connecting to the past. I'm excited about crossing the Alps, but walking along Roman roads, slowly nearing towering steeples, wandering through silent abbeys, and imagining travel in an era before cars and planes â€” that's what sets this trip apart." 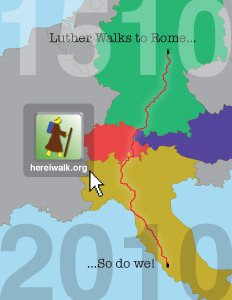 "Actually walking the huge distance from Erfurt to Rome is essential to our goal," commented Sarah Wilson. "The Reformation ended up severing the connection between Lutherans and Roman Catholics. We are trying to heal that broken link, reconnecting divided places with our own footsteps. We hope others will join us in spirit and in prayer, even if they can't walk with us in person, on our quest." What lies at the end of the journey? "Our final destination will be the tombs of St. Peter and St. Paul," responded Sarah Wilson. "Symbolically St. Peter stands for the Catholic church and St. Paul for the Lutheran church. Peter and Paul had their quarrels, but they had the same faith in Christ and both were martyred in Rome. The apostles' witness invites Lutherans and Catholics today to reconcile on the basis of their shared faith."